Where do you need the solar installer? Let’s Go Solar provides an array of resources to help consumers figure out what kind of solar panels to put on their home and what they cost. We interviewed editor Laura Brigham, who has installed a 5 kwh array on her own home, about the options homeowners should be aware of, as well as how to pay for them. “Solar panels” is a generic term. We understand how they work. But are there different kinds of solar panels homeowners should be aware of? Can you give us a brief explanation of each? Besides price and efficiency, are there other advantages of one type of panel over another? Which of the panel options is best for residential use? How can a homeowner decide which panels to select? How does a homeowner decide how many panels to get? Once the selection is made, how can a homeowner pay for what could be a very expensive purchase? How long might it take a homeowner to get solar panels installed? Yes! There are basically three kinds of panels: monocrystalline, polycrystalline, and thin film. Despite their complicated names, their technology is pretty straightforward. Monocrystalline silicon panels are also known as single-crystalline panels. They’re made of single-crystal wafer cells cut from cylindrical crystal slabs. They’re a deep blue and generally come in a square shape, though they can also be completely circular. Polycrystalline panels are also known as multi-crystalline panels. Rather than being cut from a single crystal, they’re made from a square block of raw silicon that has been melted and poured into a mold. They’re not quite as efficient as monocrystalline panels. Thin film panels are the cheapest but also the least efficient of the three choices. They’re made by spreading photovoltaic material made of cadmium telluride or amorphous silicon on a sheet of glass or metal. All of these technologies are constantly evolving, which makes solar accessible and affordable for many more people. Because monocrystalline panels are so efficient—even in low-light conditions—they need less space to produce the same amount of power as other types of panels. They also offer a 25-year warranty, so they’re considered to be the most durable. Producing polycrystalline panels generates less actual waste than monocrystalline panels. Thin film panels are not as affected as the other two by high temperatures and shading, they’re less expensive to manufacture so more affordable, and they can be very flexible in how they’re used. Thin film panels are not a good residential choice because they require more space than panels that are more efficient. Plus, they’re not as durable as the others, so they may come with a shorter warranty. Polycrystalline panels may be less attractive, because they have an uneven, speckled blue appearance. Plus, they’re not as efficient as monocrystalline solar panels. Monocrystalline panels are the most efficient—though remember, they’re also the most expensive. It’s really a matter of prioritizing between energy-production capacity, aesthetics, and cost. If a sunny rooftop is limited, a homeowner will probably need to go with the most efficient panel (monocrystalline) to produce the needed power. Next, compare the aesthetics of the panels. For some people, the speckled look of polycrystalline panels is unacceptable, so they go with mono even though they’re more expensive. But if lowest-cost is your No. 1 priority, then polycrystalline panels are probably most attractive to you. First, a homeowner needs to determine his or her solar goals. Are you trying to offset 100 percent of your energy needs, or is your goal to offset a partial amount of energy used? Next, you have to consider how much electricity the household uses. It’s not about the size of the house, but rather the amount of energy used inside it. This is where your old utility bills come in handy. Generally, the more energy you want to produce, the more panels needed—although the size of the individual panels impacts this as well. There are two main costs. The price of the panels themselves, and the price of installation. Solar panels typically make up 25 to 30 percent of the total price of installing a solar system. Overall costs will depend on the scope of the project—how many panels—rather than on the individual panels. Budgeting for installation should include an electrician and general construction labor and racking, which connects the panels to the roof or the ground. 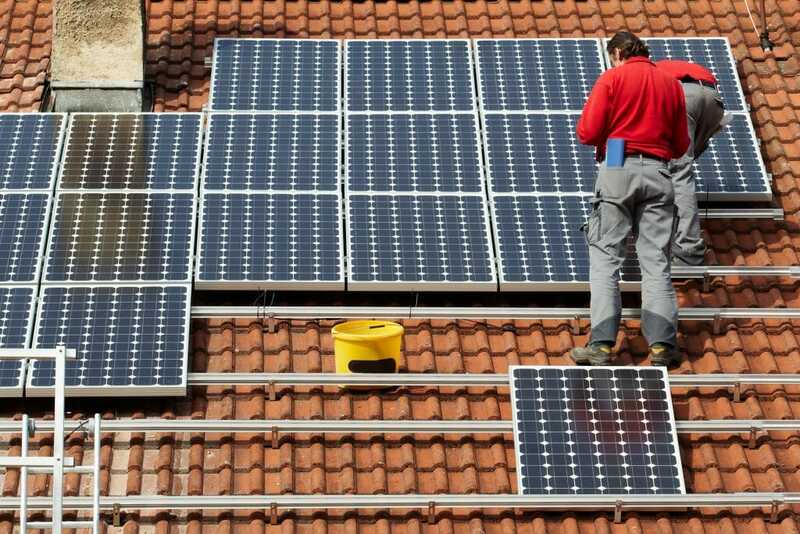 It should also include permitting and fees, which may include fees to connect to your utility grid, an inverter for solar power to convert the DC electricity the panels generate into appliance-friendly AC electricity, and other components, like wiring and incidental hardware. Once the homeowner has the complete budget, he can pay for the system up front either with cash or financing. Or, it’s also possible to lease a system. In that scenario, the homeowner pays nothing to put solar panels on his home, but then pays the solar company a monthly fee based on the electricity the panels generate. Federal solar tax credits are available to homeowners who opt to purchase their systems. Some states also offer tax credits, while some utility companies offer rebates. All of these options can help reduce the cost of a solar system. And of course, reduced electricity bills help offset the cost of the system, as well. Like many home improvement projects, the actual solar panel installation time is generally pretty quick. It’s the design, permitting, etc. in the lead up that take time. Most arrays take only a matter of days to install on the home. Then, with a grid-connected array, you have to wait for approval from the utility company to actually commission (turn on) the system, and that time varies widely from days to weeks between utility companies. What is a Sun Number Score When it Comes to Solar Panels? How Many Solar Panels Will Power Your Home?